eBelow, online at eBelow.com, is your destination for accessories for Apple computers and products. eBelow sells cases, including leather cases, for iPads, iPhones, iPods, and Macbook Air. eBelow also carries skins, chargers, stands, headphones, adapters, speakers, batteries, FM transmitters, Stylus Pens, button stickers, and waterproof bags. You can also find iPad screen protector films at eBelow. RetailSteal.com has the best eBelow coupons, eBelow discounts, and eBelow promo codes, and eBelow coupon codes. Shipping and handling rates at eBelow depend on the pricing of your order and the destination for your shipping request. See website for full details, exclusions may apply. Check out eBelow.com and save up to 40% off a wide range of electronics cases and accessories. Shop online at eBelow.com and enjoy a $1 discount on any order with this exclusive RetailSteal coupon code. Get a 33% discount on the iPad 2 Mobile Bluetooth Keyboard at eBelow. Click link to buy. Save up to $61 on an iPad 2 case with a Bluetooth keyboard at eBelow. Click link to shop online. 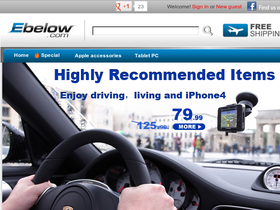 Pay Only $12.99 for a Mini-USB Car Charger when shopping online at eBelow.com. Click to shop. Buy a Protective Stand Case for the iPad 2 at eBelow and pay only $18.99. Click link to purchase now. Pay only $29.99 for a Multifunction External Power Bank for the Apple, Blackberry, or Nok online eBelow.com. Click link to buy. Pay only $39.99 for a smart cover for the iPad2 online at eBelow.com. Click to shop. Get a free Fishbone Cable Tidy at eBelow. Click link for savings. Get free shipping on all orders when shopping online at eBelow. Click link to shop. Shop at iPhone Case Mall this football season and save 20% on Coveroo cases when you use our coupon code. Shop for iPad cases at iPhone Case Mall, with cases starting as low as $15. Click link to shop. Save up to 70% on package deals online at iPhone Case Mall. Click link to shop and save. Get free shipping on package deals at iPhoneCaseMall.com - click link to save on protection and accessories for you iPhone. Visit iPhone Case Mall and use our coupon code to save $3 on your purchase of $25 or more.